Paint a broad smile on the faces of the people you love on Raksha Bandhan by sending them this Extravagant Gift of Delicious 100 Gms of Soan Papri from Haldirams along with Enigmatic Gold Plated Thali complemented with a free Rakhi, Roli Tilak and Chawal. The pattern of the Rakhi may comes with variation. Nicely Gift Wrapped Golden Plated German Silver Thali (Size: 5-6 inch) with Soan Papdi (200 gms Gross Weight) from Haldiram and 1 Free Rakhi, Roli Tilak and Chawal. Nicely Gift Wrapped Golden Plated German Silver Thali (Size: 5-6 inch) with Soan Papdi (400 gms Gross Weight) from Haldiram and 1 Free Rakhi, Roli Tilak and Chawal. 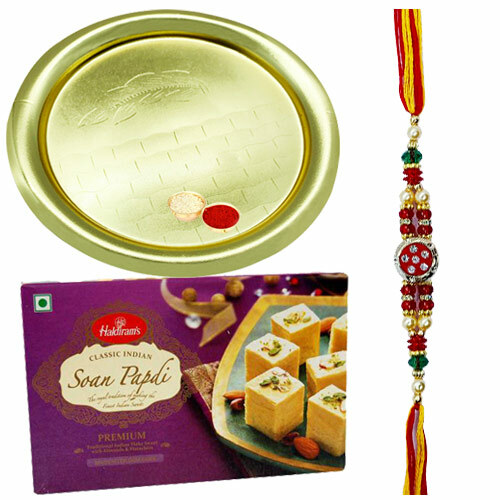 Nicely Gift Wrapped Golden Plated German Silver Thali (Size: 5-6 inch) with Soan Papdi (1 Kg Gross Weight) from Haldiram and 1 Free Rakhi, Roli Tilak and Chawal.